We all feel like giving up at some stage. This quote and life story remind us that we should never give up in the face of adversity. Born in New York, USA in 1917, Louis Silvie “Louie” Zamperini was an American World War II prisoner of war survivor, inspirational speaker, and Olympic distance runner. He represented the US at the Berlin Olympics in 1936 at the age of just 19, however his athletics career stalled following the outbreak of World War II. In 1943, his plane crashed into the ocean killing eight of the eleven people on board. 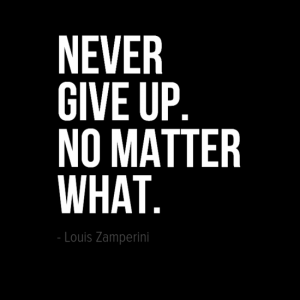 Zamperini was one of the survivors and spent 47 days adrift at sea before reaching the Marshall Islands and being captured by Japanese soldiers. He spent the rest of the war being tormented by his captors. At the end of the war he returned to the US and became a born again Christian and inspirational Christian speaker. One of his key themes was that of forgiveness and the forgiveness of those who had mistreated him during the war. In 2010, a best-selling book was written about his experiences, which was adapted into the film Unbroken. This film was directed by Angelina Jolie, adapted by the Coen brothers, with Jack O’Connell playing Zamperini.